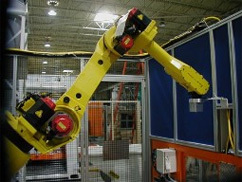 TBD Enterprises provides compliant knife technology combines the efficiency and simplicity of our standard turnkey robotic systems with the latest and greatest knife trimming technology. The compliant knife technology gives blow molders and injection molders the ability to process parts quickly, easily and safely on a system that is flexible, reliable and easy to use. TBD Enterprises also offers ultrasonic knife trimming systems. Ultrasonic knife technology is ideal for trimming soft materials (like cured and uncured rubber, soft plastics, cloth, polyurethane, foam and leathers, among others) that can’t be cut easily with a compliant knife. Contact TBD Enterprises for more information on knife trimming systems.